10 kids dance videos where you get to hang out with the Pirate Sessa in her father’s dungeon – to dance and just have fun. The dance moves are made for children around 2-7 years old, the dances are named after words that children recognize. As an adult you can say the dance titles the first few times, ”this is the helicopter dance” for example. Your child will soon know all the titles and will probably find some favorite dances, and they might vary over time. 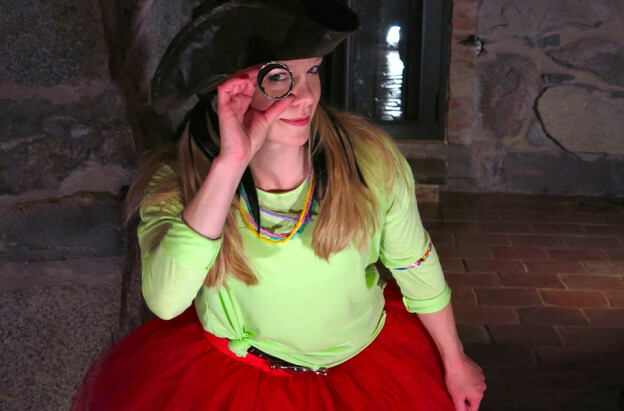 The Pirate Sessa kids dance concept is made to do at home in the living room, at the birthday party or in pre-school. Each dance video and song has a theme that the child can relate to – with simple moves so that the child can just follow along. The dances in ”Pirate Sessa in the Dungeon” are inspired by the helicopter, mosquito, sun, the indian, lion, train, detective, bounce ball and skiing. Video and music for each track. Dance number 10 is freeze dance, which is popular with many children, built-in pauses in the music makes it easy to do dance and freeze – again and again. Lift, spin, turn and land like a helicopter. The moves are developing arm coordination and balance – in a fun way. Training to move the body in different levels, touching the floor alternated with pointing up toward the ceiling. Role play that makes you feel like a real mosquito hunter! The sun rises and shines! Develops the ability to move arms in a circular motion, and jumping apart and together with the feet – moves that improves coordination of the whole body. Pirate Sessa can actually see your danceable smoke signals when you do this dance. Fun and great moves for arms and shoulders. High jumps and jumping on one leg develops strength, balance and body awareness. It is a lion coming on the road, paw, paw, paw (when you clap the hands on your knees, as if a lion comes walking), and you also get to follow the lion along going hunting and searching. The moves improves rhythm and good for the child’s coordination skills. Chug, chug, toot, toot – time to do the train dance! Dancing like a train, chugging forward, backward. Maybe also pretend that you are traveling to an exciting place you like (doesn’t need to be far away) and of course – pulling the train honk! Practising walking in different directions and rolling your shoulders (like train wheels do) develops coordination. Scouting, sneaking and looking around – that’s how to dance like a detective! Bending and stretching arms and legs and walking around and let your feeling decide the next move. When dancing, the moves doesn’t have to be cool and on beat. Uncool and off beat is as much fun – or even more fun. Jumping and bouncing like a bounce ball, great fun! Functional, natural moves for the entire body. Being on beat is not important (goes for all dances with the Pirate Sessa), just move your body and have fun! Skiing in a little groovier way than usual – a more danceable way. Staking, skiing, downhill skiing with skis and ski sticks. Good for coordination and training in syncing left and right sides in different patterns. Dance, freeze, spin around, jump, freeze, run, shake, freeze – dance any way you want to and enjoy it. Dance like nobody is watching! Good practise in imagination, improvisation and independent thinking. Wanna watch one of the dances in the app? Where you find this kids app? Want digital bottle messages (exciting e-mails) from Pirate Sessa? Do you like Pirate Sessa? Please write a few words on the page word about. It would make the Pirate Sessa's day! creator of the international training apps Poworkout (the swedish power workouts).